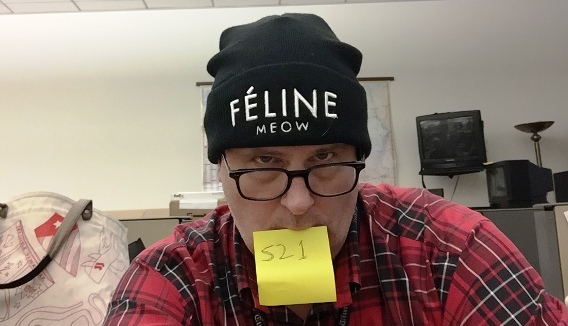 Black, 100% acrylic knit cap with white all-caps embroidery that reads: "Féline" on one line and "Meow" on the other. Interior tag gives the country of manufacture as China and interior label (which says "made in U.S.A." - we assume that's essentially a result of putting the embroidery on the finished cap stateside) says "BLTEE Brian Lichtenberg." This knit cap was purloined from the Bride this morning as it's a rare rainy Los Angeles Monday and the old noggin needed some insulation. And, in case you're not fluent in fashion, it's meant to be a parody reference to the Céline luxury label. This isn't the first time we've featured one of Lichtenberg's fashion parody pieces in the Project, a white version of the cap (riffing on Balmain) appeared as Hat 260 and a parody of his parody pieces clocked in at Hat 256. Q: OK, fun hat. But what is -- or was -- Project Cubbins, exactly?